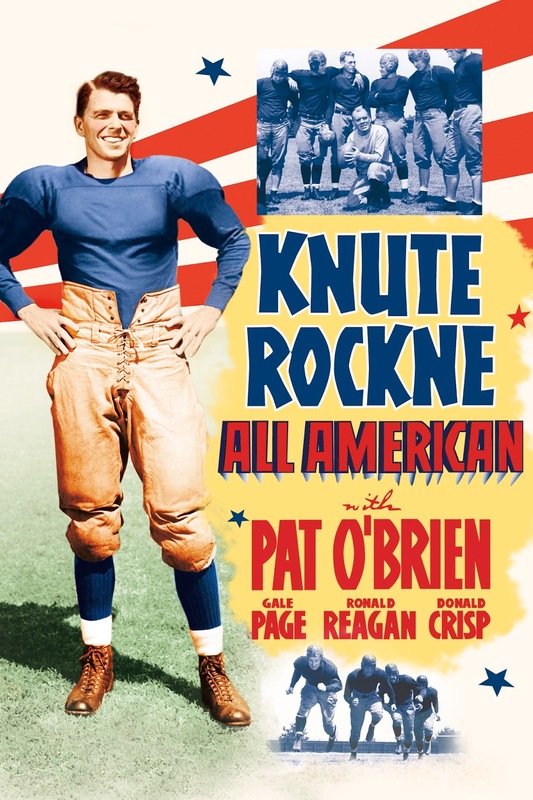 Knute Rockne-All American (1940), starring Pat O'Brien and Ronald Reagan, is one of the 1001 classic movies you should see. Each Monday, I'm going to recommend a classic movie you should see (for the reasons behind the 1001 series and reviews of earlier films covered go here). In honor of the Presidential election on Nov. 8, this month's selections will focus on film portrayals of U.S. commanders in chief. 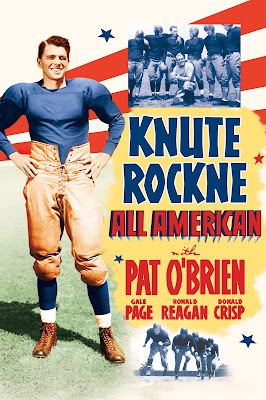 This week's movie is the biopic Knute Rockne-All American (1940), which gave Ronald Reagan his Gipper nickname. Knute Rockne-All American follows Knute (pronounced "Canute") Rockne (Pat O'Brien) from his childhood in Norway to his early day in Chicago after his family immigrated to the U.S. Rockne majored in chemistry at Notre Dame University in South Bend, Ind., and he later taught at the school, but eventually, his passion for football took over his life. He became Notre Dame's head coach where he popularized the passing game and made Notre Dame a national football powerhouse. Rockne was one of America's biggest sports celebrities in the 1920s and 1930s, and his untimely death in an airplane accident in 1931 meant that his life story was a hot property for Hollywood studios. Warner Bros. eventually obtained the rights to Rockne's private papers, and they considered casting James Cagney (Notre Dame officials weren't comfortable with his Progressive views) and Spencer Tracy (MGM wouldn't loan him out) before settling for 41-year-old O'Brien. The result was a box-office smash that became one of the best-known films of O'Brien's career and started the trend of inspirational sports movies. Coincidentally, Knute Rockne-All American features the best known film role of Ronald Reagan. The future 40th President was a struggling Warner's contract player when he was cast in the plum role of Notre Dame football star George Gipp. There were several young actors who wanted the part, but Reagan won out over the likes of William Holden and John Wayne by showing Warner's executives pictures of himself playing football at Eureka College. Reagan's screen time is actually fairly minimal -- he's only in the movie for about 20 minutes -- but his portrayal of "The Gipper" as an honest, hard-working Midwestern boy with a lot of talent became forever entwined with his political legacy. 1. O'Brien. Although Reagan is the most-talked about actor in Knute-Rockne-All American, O'Brien gives one of his most memorable performances in the lead role. He is noticeably too old in the early scenes, but otherwise he is great, especially when recreating Rockne's famous locker room speeches. 2. Notre Dame. Rockne's legendary coaching skills made Notre Dame football a national powerhouse, but Knute Rockne-All American's mix of piety and gridiron glory made the Indiana school a national touchstone for Catholic Americans. 3. Sports movies. These days it seems like an inspirational sports movie is released every other week, but sports, and especially football, was usually the territory of comedians until Knute Rockne-All American was released. The film's success inspired other forties biopics like The Pride of the Yankees (1942), and today's sports movies like The Blind Side (2009) are its direct descendants. 4 Win one for The Gipper. Reagan's famous last line, "sometime when the team is up against it and the breaks are beating the boys, tell them to go out there with all they've got and win just one for The Gipper" has often been misquoted even by Reagan himself. 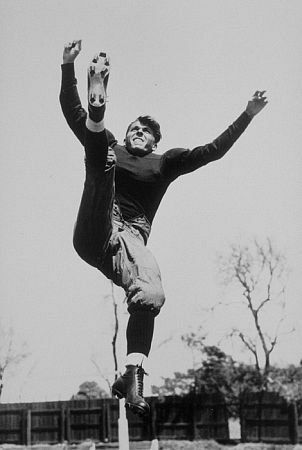 Ronald Reagan shows off his kicking skills in Knute Rockne-All American (1940). Other critics: Knute Rockne-All American has an 83 percent fresh rating at Rotten Tomatoes and Leonard Maltin call the film "a corny, but entertaining bio" in a three star review for his Classic Movie Guide. Critics in 1940 mostly liked the movie with a few reservations. Variety wrote that the film was "one of the best biographical picturizations ever turned out ... Pat O'Brien delivers a fine characterization of the immortal Rockne, catching the spirit of the role with an understanding of the human qualities of the man." The New York Times Bosley Crowther rather oddly complained that Knute Rockne-All American contained too much football. "We are inclined to question its overemphasis on the pigskin sport," Crowther sniffed. 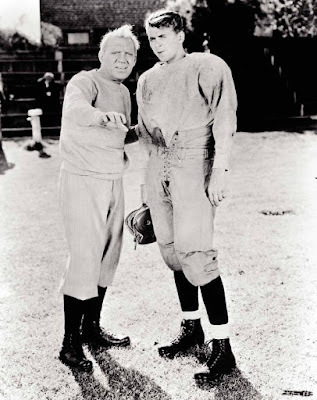 The bottom line: Knute Rockne-All American is one of the best sports movies ever made in Old Hollywood. Watch it for O'Brien and Reagan and several enthusiastic renderings of the Notre Dame fight song. Availability: Knute Rockne-All American is available on DVD and video on demand. Next week, I'll begin the December theme of Christmas movies starring Barbara Stanwyck with she and Fred MacMurray's first film together, Remember the Night (1940).